RosterWatch Nation, the time has come to once again dominate your fantasy drafts. The original epic three-step cheat sheet is now available for download to RosterWatch PRO members. Most of you have used the Cheat Sheet in previous seasons and you know it’s the simplest, most effective and most easy-to-use fantasy football draft tool on the market. 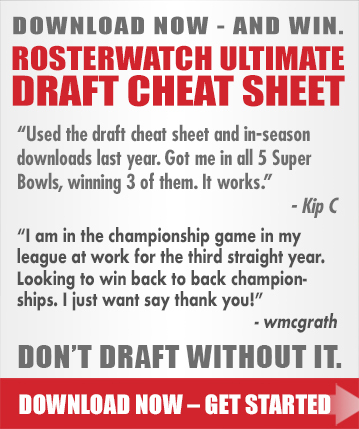 DOWNLOAD V.1.0 of the 2018 RosterWatch Ultimate Draft Cheat Sheet (2QB/Superflex) – START HERE!!! ****Standard/.5 PPR and auction sheets will be added soon. Hello, and thank you for the magical, mystical ultimate draft cheat sheet (it really is)! This year, so far, I only see the PPR version and the 2 QB/superflex versions. I think last season that there was a separate sheet for non-PPR (which was also to be used for 1/2 PPR). Is this still the case, or are you recommending the full PPR for these types of leagues, as well? Hey guru, thx for being a valuable member of RW Nation. The standard/.5 ppr cheat sheet will be out at some time prior to Byron leaving for the Training Camp tour, probably on the week before 8/1. Thank you Alex!! I wanted so badly to call into the show on SXM to let the other members of RW Nation know what the cheat sheet did for me last year. To summarize: It wasn’t all smooth sailing in the one 12 team draft that meant the most to me. In round 5, some weird snag cost me my fifth pick, and somehow I ended up with safety Jamal Adams. Then, because I had opened the cheat sheet in a new tab, I inadvertently went back on the browser and lost all my cheat sheet selections (lesson: open it up in a brand new window). I scrambled, franticly, over the next few rounds and caught up, still able to stay tight to the rules of the sheet. I ended up with… Todd Gurley, Julio Jones, Deandre Hopkins, Keenan Allen, Larry Fitzgerald, et al, and for kicks, I took the Baltimore Defense. Needless to say, I slaughtered my competition, and won in grand fashion. Thank you to all the hard working folks at Rosterwatch, and you have gained an eternal subscriber and RW Nation fanatic!! It doesn’t get much better than that. Is Barkley over Antonio Brown crazy in a PPR league (I’m keeping Odell and Kamara, I have the 1st pick). The RB options in the late 2nd are much worse (Guice, Drake) then WR (Cooper, ARob, Fitz). The league only starts 2 WR, 1 Flex. In your situation, it’s fine, the only problem is, how many NYG players do you want among your core of studs? I love Odell and Saquon, but might feel like it would be best to diversify in case Shurmur doesn’t work the magic w/ Eli that we’re all hoping for to get the most out of those guys + Engram and Shepard. 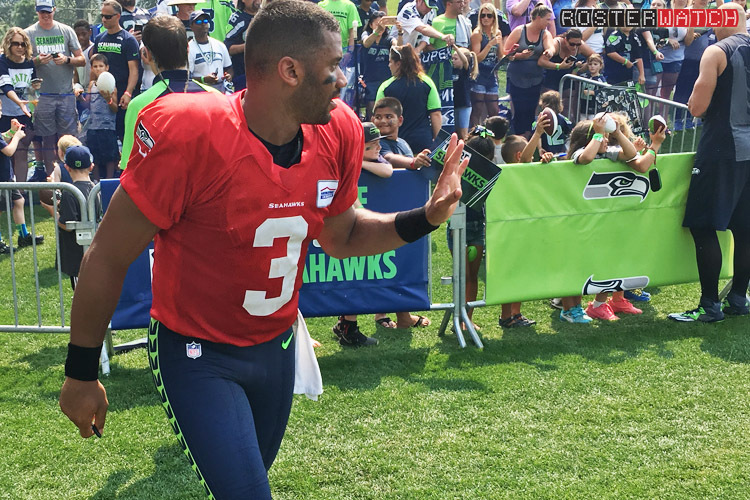 I agree Alex, having two of my top guys on a team that struggled last year isn’t ideal. Looking at your cheat sheets it just seems like WR is deeper then RB this year, especially in a keeper league where a lot of the top RB’s are kept. Initially my thought was to keep Cook, Julio, Cousins and Cooper knowing I’ll land either DJ, Barkley or Zeke with the 3rd overall pick and have Kamara for free in the 17th RD. Wondering is Zeke far above DJ and SB that i should keep him and ditch Julio, Cousins or Cooper? Or stick w my original plan knowing my first three backs will be a combo of Kamara, cook, Zeke/DJ/Barkley? Or is Cousins the one to drop!? Not too sure how many qb’s will be kept. Also to note, I dont have a fourth rd pick. So many possibilities! You’re expert quality advice would be much appreciated. I think you have this one right Deagsdan, especially in a superflex. You have a monster brewing here! Hey guys. Thanks for the great product. Last year was my first year using and I won both of my leagues! Quick question: I noticed the Best Ball cheatsheet has been taken down. Will that be re-posted, or should we just use the PPR sheet in its place? Thanks again. No thank YOU sir! For now we’d say use the PPR cheat sheet. We usually take the best ball sheet down around this time as it differs somewhat from the redraft stuff and it gets less and less use the closer we get to redraft season. I would say though, in best ball, I’d push the RBs up the sheet a little. Since you are picking more players, you can take many more fliers on WRs late and there are not as many super-late round RBs with similar upside. The PPR sheet is designed to get you a more well-rounded team through basically 14 rounds of picks where you have more like 17-18 in best ball. Is the Superflex cheat sheet based on PPR scoring?